As home and work becomes more automated with technology there is a need in the market for innovations and better solutions for professionals and for homeowners installing home theaters and networks. The Gardner Bender Voice Data Video offering includes tools, testers, connectors and fasteners that will support both coax and data installations. 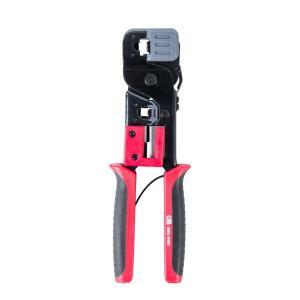 The Gardner Bender Modular Plug Crimp Tool is used to produce patch cable and handset cables, cut, strip and crimp. Tbook.com crawls the web to find the best prices and availability on Crimpers and related Tools and Hardware products like Gardner Bender Premium Metal RG11 RJ45 Modular Plug Crimper. For this page, related items include products we find that match the following keywords: "Crimper" at our vendor partner Home Depot. Gardner Bender Premium Metal RG11 RJ45 Modular Plug Crimper is one of 41 Crimpers and related products listed in the Tools and Hardware section of Tbook.com If you have any questions on this product, please give us a call at 734-971-1210 during the hours of 9am - 5pm EST for assistance. Thank you for shopping at Tbook.com, the Internet Department Store!